With considerable apprehension, I slit open the packing carton with my Swiss army knife. Carefully removing the top layer of wadded up paper, I gazed for a moment upon the smaller boxes within before picking up one of them. I then selected the larger of the two and opened the top flap of the box. All day, I had known this moment would come. All day, I had felt on the verge of tears thinking about it. But now that the moment was here, I felt nothing but an odd sort of curiosity. Reaching inside the box, I withdrew the new one and cradled it in my hands. I turned it this way and that, examining it carefully. “You don’t feel my old camera,” I said, being perhaps a bit insensitive as I noted its textured grip. Again, there was no response. What could the new one say? I played with it for a few minutes, noting some of the similarities it had to my old friend, as well as some of the differences that puzzled me. I wanted to play longer but there were many other duties clamoring for my attention. I put the new one back in its box and hid it for safe keeping. Someday soon we would have we would have to find time to get to know each other better. Slipping back into the familiar darkness of her box, the new one felt puzzled. She had felt exhilarated when she first emerged into the bright world, anxious to begin capturing its sights and sounds. She did not understand why she had been put away almost immediately. She had heard the mention of the “old camera” and these words stung a bit. Was she being rejected? She had thought that she at least would be cherished enough to be placed in a nice camera bag in a prominent part of the house. Instead, she was put back in the box and hidden in a dark place where no one would see her. What was wrong? It seemed forever before her person came for her again. But finally, on a chilly Sunday filled with sunshine, she was brought out of her box again. She looked around, seeing the inside of the house she had just had a glimpse of before. It was a fairly plain house, mostly beige actually, to her disappointment. 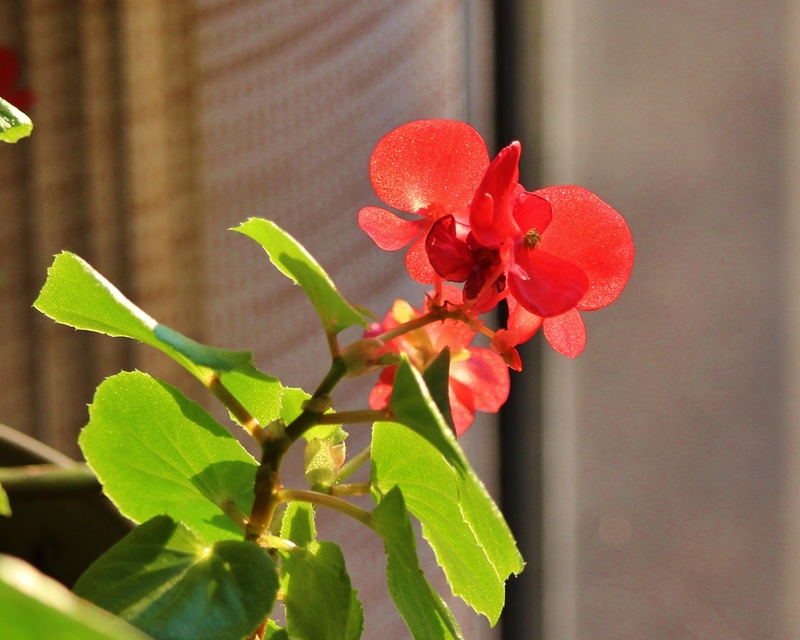 But her lens, being naturally drawn to light and color, spotted a blossoming begonia plant resting in the sun by some sliding glass doors. More than a week had passed before I was able to get back to the new one. Finally, on a Sunday, it was bright and sunny – cool, but a good day for a first walk together. Time was short and, while I would like to have walked in the neighborhood, I didn’t feel quite comfortable doing so yet. Would I just be advertising to a burglar that I had a new camera? My back yard has often been a good place for unexpected delights, even in the most unfriendly of seasons. A fine place to begin. Slipping out the sliding door, a barren rose bush caught our attention. 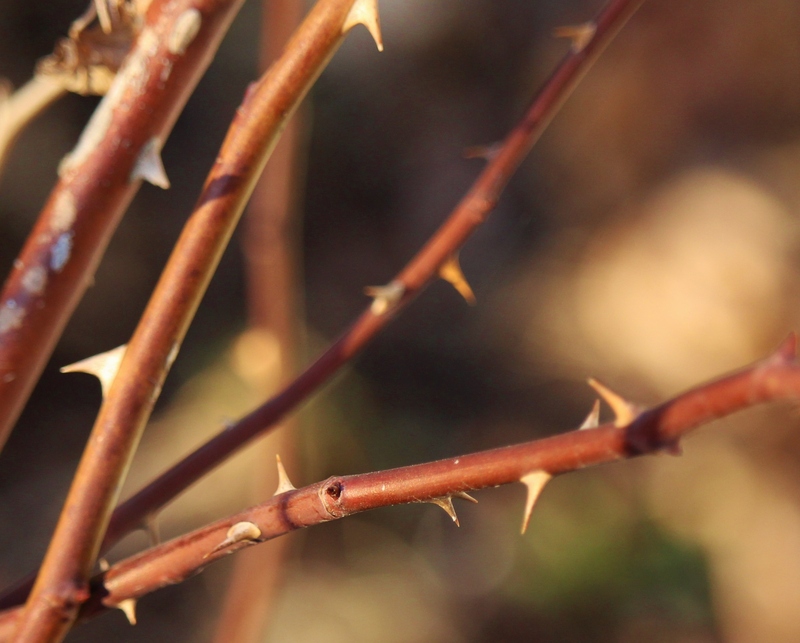 We paused reverently, receiving an image of its thorns, remembering the Savior who once humbly wore them on His head. Next, my attention naturally moved to the “crime scene” now that the high banks of snow no longer concealed the place where it all began. The new one, unaware of the history, felt inexplicably drawn to three cinder blocks casting their shadows in an assymetrical row. Was there one missing? 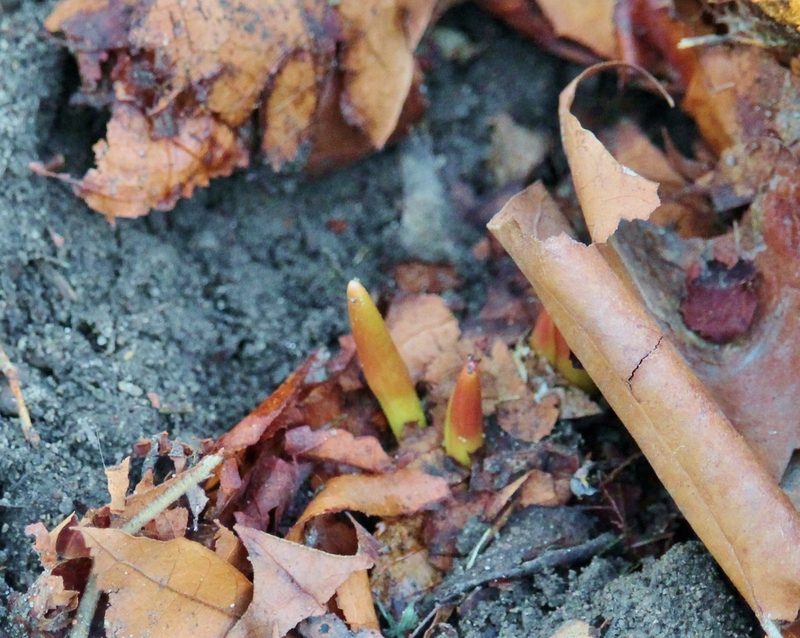 Could there be any other signs of life in this barren world? Already I was getting cold and the air around us still carried the prickling chill of late winter. 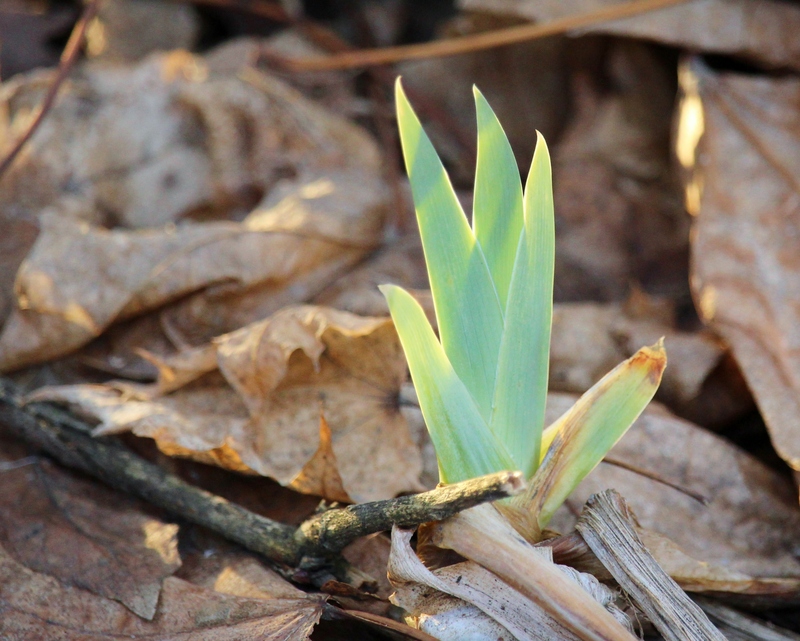 But there, something is trying to make its way to the surface, something tiny but growing…. again we zoomed in among the decomposing matter. Before going back to the warmth of the house, I walked my new friend to the fence. The fence is often a place of fascination for all of its ordinariness. 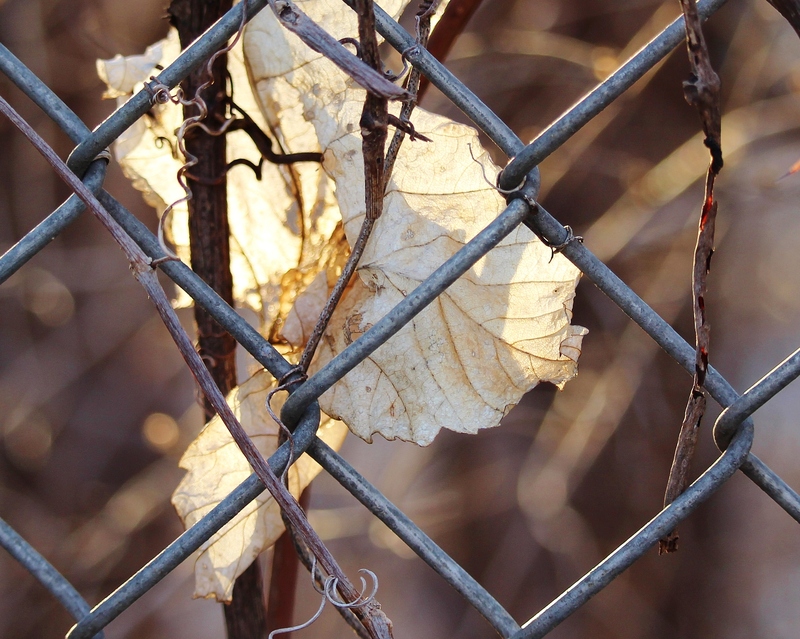 Especially in the months of death and dying, the remnants of all that clung to the fence and curled and twisted around it form a unique art that comes alive in the late afternoon light. Back in the warmth of the house, my camera and I took a moment to savor the simple images that we received together. Apologizing this time, once again I hid her in a dark place where no one would find her. The short walk in the brisk cool air had felt surprisingly satisfying to the new one. While she was waiting to be deployed, she had always imagined herself taking dramatic photos of majestic natural beauty or capturing special, heart-warming moments that occur only once in a family’s history. This first assignment was so far from any of that that she would feel embarrassed to describe it to any of the others. At least she thought she would have been embarrassed. It was so…ordinary. Yet she sensed a special connection as she rested in the hands of her person. It was not as though this person did not know what beauty was – but rather that she did. She had a different way of seeing that the new one had not been taught. She used her eyes, of course, but it was as though she saw with her heart. Though no words were said aloud, the new one also became aware that her person experienced images as something she received, not something she “took” or “captured”. They were gifts. And these gifts were not manufactured by human hands but were outpourings of the Creator Himself. As the new one pondered this, she realized something new and startling about herself: that it was through her that her person would receive these extraordinary gifts. They would receive them together in an intimate partnership that neither could fulfill alone. She was struck with awe at this revelation. Never at the factory had she or the others been prepared for anything like this. Theirs was a sacred mission. How had she not seen this before? Why had she not been told? Suddenly, she understood. The new one did not know how she could have missed seeing it before. Her person had loved her old camera. Of course – she must have. If she and the old camera had walked many walks and received many images together, how deep their bonding must have been. And something, she didn’t know what, had severed that bond. Her person must be hurting. She now learned something else that no one had prepared her for at the factory: that she was being called to be an instrument of healing. She was being called upon to simply walk with her person, to be at her side, to receive with her whatever life gave her next. This entry was posted in Uncategorized on March 25, 2015 by mary. Sorry, Al. I have to remember that my “stream of consciousness” writing is not going to make sense to everyone! 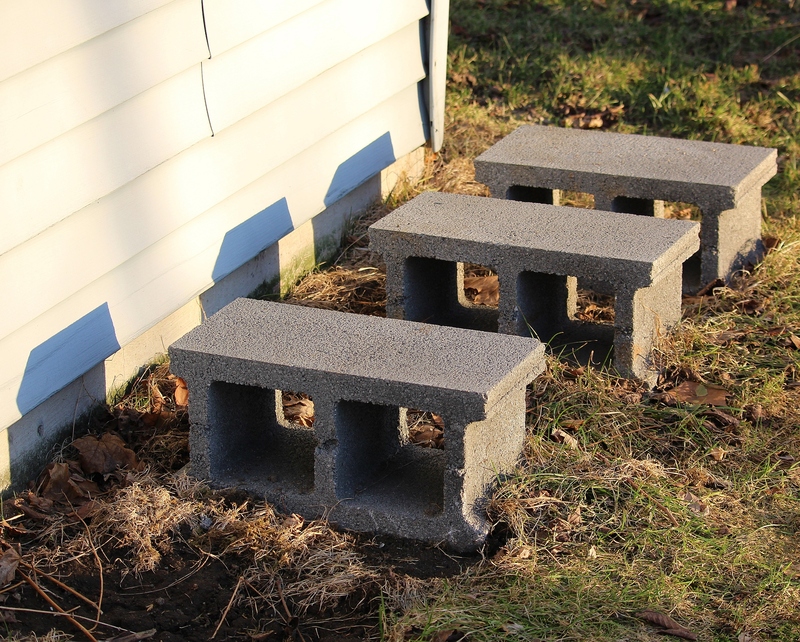 I had four cinder blocks in my back yard, two pair, as each pair supported a rain collection barrel in the warmer months. The rain barrels moved to the garage once temperatures were freezing but the cinder blocks remained outside as they are quite heavy and, I thought, unnecessary to move. Yes, one of them came through the window. Given how barren my backyard is at this time of the year, the shadows they created drew my attention as interesting.